Welcome to Palm Beach Shores on Singer Island, the best little town in Florida. Totally remodeled 2 bedrooms, 2 bath ,newer appliances, FURNISHED /TURN KEY, with view of Ocean from balcony. Beautiful remodeled kitchen with granite counter taps and lots of custom cabinets. Condo has beautiful pool and outdoor space. Steps to beach, walk to dining and more. Enjoy the Island lifestyle. Gorgeous Ocean view from LR and both Bedrooms! Owner excellent, property all that we hoped for, building staff specially friendly and helpful. The residents and the renters in the Mayan were an added plus and enhanced our stay. A beautiful space and gets a 5 star rating from both of us. It was great to meet and host you both. Very glad you enjoyed the stay and hope we have the opportunity again. We really enjoyed our stay. The condo & location was exactly what we were looking for. The owners were very helpful and accommodating. 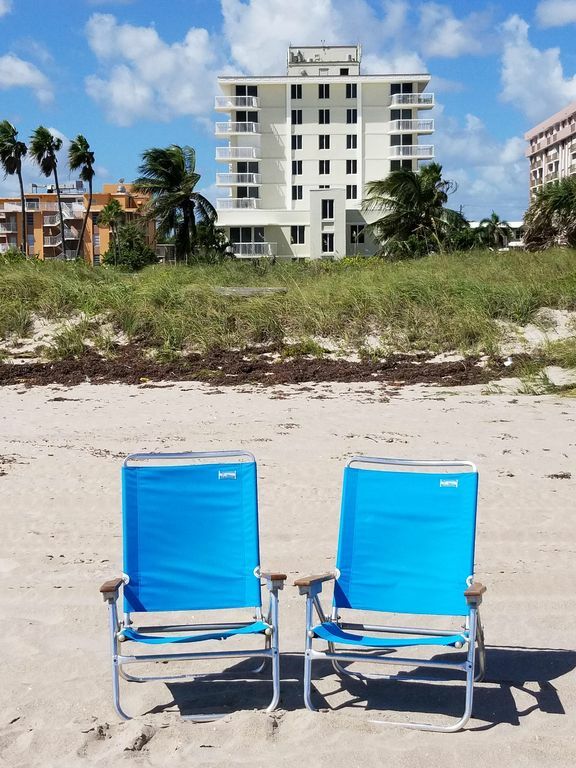 We would highly recommend this condo. It was great meeting you guys and look forward to hosting you again next year. Have a great summer! project began months ago giving us enough time, had we been informed, to reconsider plans at this place. We love Singer Island and this condo was perfect for us. However, when we were looking for a unit we asked about the mattress as my husband has a very bad back. We were informed the mattress would be upgraded to a pillow top Sealy Postopedic mattress. My husband complained about the mattress but I informed him it was an upgraded pillow top mattress. He complained daily about the mattress. To my surprise upon leaving, I stripped the linens and mattress cover only to find a very old, worn out, very stained mattress. This couldn't have been an upgrade. The only thing I can say is I was very disappointed on the deceitfulness of the owner. If they would get a new mattress in the master bedroom it would be a nice unit. Thank you for your feedback and we are sorry to hear that your husband wasn’t happy with the mattress. We understand that everyone has their own preference for how soft or how firm they prefer their mattress. We had hoped that since your son had done the walk through and had sat on the bed and had given an OK to the softness, that you would also like it. But alas, that was not the case. We did ensure that there was a firmer mattress in the second room – to try to cover the spectrum. The mattress you slept on certainly has superficial issues, and we don’t dispute that. However, it is structurally sound and an upgraded model. We have slept on it before and after your stay and we find it to be very comfortable. While I agree that it is ‘dingy’ from the cheap navy sheets that were on it originally – along with scuff marks on the sides from the movers, I would disagree that it is ‘old and worn out’. We made sure that it has a cover, a plastic cover and a soft sheet on top of the plastic to cut down on any crinkling and then sheets on top of that. We did check in with you during your stay, and the feedback was positive and you had said that the bed was comfortable. If you had any issues during your stay, we would have gladly address them. That is the promise we make to all our guests. In any event, we are in the process of replacing the mattress which will be completed shortly. Most of the other furniture was brand new as of December. We welcome you and your family back, and we’re confident that you will be pleased with the completely new bedding. There is a 3 month minimum for rentals which include the month of February. Rates are subject to change until reservation confirmed. For the Winter Rate - there is a 50 night minimum - the system wouldn't let me select 50 nights.